Despite years of recovery, California's economy has prevented many from climbing into the middle class. To help them up the ladder and to fill jobs opening up over the next decade, the state needs to add one million more graduates with bachelor’s degrees and one million more workers with middle-skilled credentials. California's income inequality gap has widened during the recovery, with low-income workers facing the biggest gap in a state with a high cost of living. At the same time, companies in health care, IT and manufacturing are struggling to find workers with the right skills to fill well-paying jobs. By 2025, 30 percent of the state's workforce will need to have "some college" experience to have a job in the economy, meaning some form of post-secondary education. That number represents 1.9 million people. To restore upward mobility and meet employers’ needs, significant progress has been made toward the workforce goals of the Summit's Roadmap to Shared Prosperity. The Summit participated on the California Community Colleges Task Force on Workforce, Job Creation, and a Strong Economy, convened by the Colleges' Board of Governors and partly inspired by the Summit repeatedly identifying workforce and skills issues as big problems in all regions of the state. The Task Force--consisting of leaders from the business community, labor groups, and the public sector, along with two representatives from the California Economic Summit-- completed a final report of recommendations this summer and are being considered by the Board. The proposals included strategies for aligning student outcome and labor market data, updating community college curricula to better match workforce needs, expanding successful “career pathway” programs, and improving coordination and funding streams across the state’s economic regions. Career technical education programs (CTE) have been losing funds for more than a decade in California, despite their ability to create needed middle-skill workers. The big challenge is that CTE courses can cost colleges four to five times more to offer than traditional academic programs. "Without the regional coordination and understanding the needs to of regional economies, colleges won't naturally put more investment into the area of CTE," said Van Ton-Quinlivan, vice chancellor of workforce and economic development in the Community Colleges Chancellor's Office. "We've seen that for the last decade already." There has been a stigma and lack of awareness about CTE programs in California, which don't always require a four-year commitment but can land graduates high-pay, in-demand jobs, like health care or advanced manufacturing careers. "But I think one of the issues is just the stigma that people assume that CTE means welding," said Kathy Booth, WestEd's senior research associate, presenting a report on workforce data and career training outcomes to the Task Force. "They're not realizing that---first of all, welding's a great career--but there are many, many different pathways that they could take." Connections between colleges and local industry typically have been uneven and uncoordinated. Strengthening those connections would help schools update their curricula more responsively and more nimbly to match labor market needs and will reduce the need for companies to build their workforce themselves. "Unless you coordinate regionally, you'll never get employers to engage and help the workforce and educational infrastructure adequately prepare students. They don't have time to engage on a campus-by-campus basis," said Jim Mayer, president and CEO of California Forward. "And from the student perspective, a lack of coordination makes it really hard for students to get what they need for their career because they can end up going to more than one college and program." 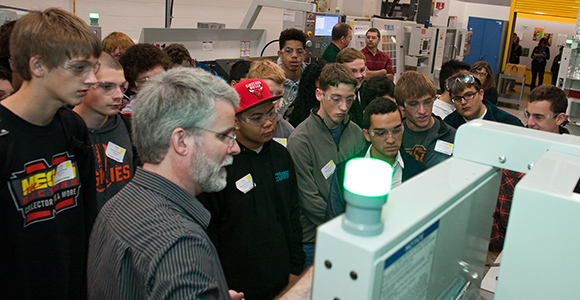 For California to develop the workforce it needs to remain globally competitive, employers must be given even more ways to play a larger role in the state’s workforce training system, the California Economic Summit emphasized in a letter to the Task Force. Out of the Task Force's effort -- and the past three years the Summit's workforce priorities -- sprang the commitment to the one million credentialed worker challenge, to be taken up at the Summit in Ontario next week. For any solution to work, two key features have become requirement: The solutions must be regional in nature and focused on aligning disparate workforce training and education efforts with industry needs. The Summit has developed a draft action plan to meet this goal through the formation of regional civic organizations dedicated to accelerating implementation of the Task Force recommendations including strategies that prepare more Californians for careers above minimum wage. Align public and private partners on goals, strategies, and metrics to help young Californians be prepared for meaningful careers. To be more effective, workforce training and middle-skill education programs should increase their ability to gather labor market data and identify gaps. Encourage coordination and effectiveness—and create accountability for results—to meet the needs of students and employers. For the skills gap to be closed, these regional collaborations will need to increase coordination between the public and private sectors and harden partnerships into tangible programs such as "contract ed" relationships. Develop and advocate for incentives that drive improvements in programs and improve job placements. Finally, organizations will need to identify and support incentives to encourage regions to do a better job of aligning their workforce efforts. Creating one million more middle-skill workers would represent wins for both the state's workforce and its employers. More details on the plan can be found in this year's California Economic Summit Playbook. Find out more information about the Summit and read the complete program for this year's gathering in Ontario on The Summit page. State and regional leaders from around the state will be participating and speaking, including Lieutenant Governor Gavin Newsom, Treasurer John Chiang, Secretary of State Alex Padilla, Controller Betty Yee, University of California President Janet Napolitano, and California State University Chancellor Timothy White.